KATHMANDU, Jan 10: The Commission for the Investigation of Abuse of Authority (CIAA) is likely to face leadership vacuum after its chief Lokman Singh Karki got removed from his responsibilities for not having 20 years of working experience in government services. The anti-graft body is likely to face the leadership crisis as its four other commissioners have also been accused of not having 20 years of working experience as stated in the new constitution. 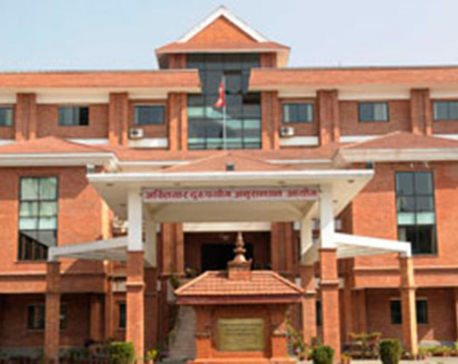 Commissioners namely Deep Kumar Basnyat, Nabin Kumar Ghimire, Sabitri Gurung and Ganesh Raj Gurung do not meet the constitutional criteria as well, according to a writ petition filed against them. The writ petition was filed by Dakshya Bahadur Chhetri at the apex court in November arguing that none of the existing commissioner except Rajnarayan Pathak have 20 years of working experience in government offices. Article 238(6) of the constitution clearly states that one should have at least 20 years of experience in the fields of either accounting, revenue, engineering, law, development or research and he/she should be a distinguished person to hold the commissioner's position. Commissioners Basnyat, Ghimire and Joshi, who came from the civil service, and professor Gurung do not meet the criteria set in the constitution, as claimed in the petition. The writ petitioner has claimed that since the constitution has not envisioned experience in the civil service as the required qualification for the top post, the commissioners except for Pathak are not eligible to become CIAA chief. Anti-corruption crusader Dr Govinda KC has been demanding removal of Pathak as well accusing him of abusing his authority in medical sector. The parliament was forced to initiate impeachment motion against Karki after Dr KC staged hunger strike demanding the impeachment. Legal experts have termed that the court's ruling against Karki has invited complexities in the anti-graft body although they hailed the decision arguing that it was essential to stop further damage of the CIAA. "The recent Supreme Court verdict has also raised the questions over eligibility of the remaining commissioners since Lokman's exit has already opened Pandora's Box," said senior advocate Shree Hari Aryal. Former CIAA chief commissioner Suryanath Upadhyay also says the remaining commissioners may also be removed from their position in the context of their head already removed from responsibility for not meeting the criteria set by the constitution. Karki, who joined the Royal Palace as under-secretary in 1984, later shifted to government service after the restoration of democracy in 1990. He was disqualified from holding the position of CIAA chief after the Supreme Court did not count his service at the Royal Palace. Along with his shortcoming of working experience, Karki has also been accused of not having high moral standards. Om Prakash Aryal, a lawyer who had challenged Karki's appointment questioning his working experience and high moral standards, however says it was up to the court to decide whether to let the remaining commissioner stay in the office or not. "Definitely, Karki's case is different from the cases of the remaining commissioners. Since the court in its recent verdict has not stated anything on how to define administration sector, it is hard to predict the fate of the remaining commissioners," said Aryal. Upadhyay argues that political parties may not appoint chief commissioner to avoid action against them. "Although it is essential to boost the morale of the demoralized CIAA, political leaders may put anti-corruption agendas on the backburner for the sake of their own career," said Upadhya. After Upadhyay's successful investigation against corruption cases, politicians had left the CIAA without commissioners for years following his retirement in 2007. In the absence of a constitutionally appointed commissioner, the power of the anti-graft body was delegated to government secretary. Some bureaucrats were charged during the period but powerful politicians largely remained scot-free despite several charges. Commissioners were appointed only in May 2013 when the parliament was not in existence.